Homemade Cool Whip that is stable like the store bought kind but made at home and SO delicious. Perfect for your favorite family recipes! The first recipe in the Pantry Series was for Condensed Cream of Mushroom Soup with many more canned soups on the short list for future posts. If you have any requests please leave comments below and I’d be happy to look into it! This recipe is a favorite of mine (I’ve been making it for about a year since finding it on Serious Eats) and I’ve used in successfully in dozens of cool whip recipes. 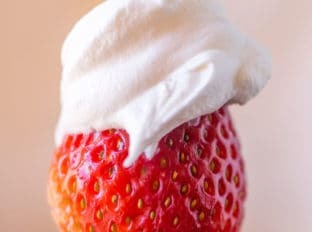 PS, just want to note, I’ve had this recipe saved on my computer and as I am linking now I see we both shot it with a strawberry like on the cover of the Cool Whip container. I guess I’m less original (even with copycats) than I give myself credit for. The consistency is both room temperature stable AND freezer safe. The gelatin keeps its stability under 98 degrees and it protects the water content safe in the freezer (thanks to Serious Eats for this data). The recipe is a version of marshmallow fluff and is NOT Whipped Cream with Cream of Tartar added in. They’re two completely different recipes. Whipped Cream with Cream of Tartar will not freeze well and defrost well. It also can’t hold up to higher temperatures or extended times outside the fridge. 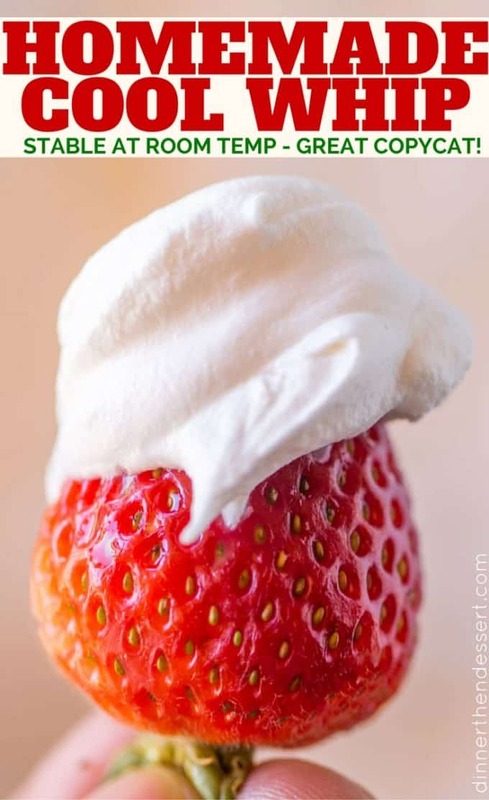 This recipe is exactly what you’re looking for, Cool Whip, not whipped cream. Don’t make the recipe without a thermometer. It isn’t difficult to make, but you do need to reach a specific temperature that you can’t guess. Powdered Milk: Good to keep in your pantry if you only use milk sparingly for recipes or use powdered milk for other recipes. Candy Thermometer: Inexpensive and indispensable in this recipe. Gelatin: Same kind you’d use in jellies, you can also use store brand. Homemade Cool Whip that is stable like the store bought kind but made at home and SO delicious. Perfect for any recipes you're making that ask for Cool Whip! Add the gelatin to the 2 tablespoons of ice water and whisk. In a second bowl whisk together the milk, powdered milk and vanilla. In a small saucepan with a candy thermometer clipped onto the side, add the 1/4 cup of water, corn syrup, sugar and salt. Whisk together and cook over medium heat until combined and in a rolling boil for about 3 minutes. Raise the temperature to medium high and cook until it reaches 250 degrees exactly. Turn off the heat and add to a large metal mixing bowl. When it cools to 212 degrees (about 2-3 minutes) add the gelatin and using a hand mixer, whisk for 5-7 minutes until the mixture is cooled and three times the size and almost pure white. Add the vanilla milk mixture in a couple of tablespoons at a time and keep beating it in until smooth until it is all incorporated. Cover with saran wrap and let sit for 2-3 hours (the structure of the cool whip needs this to be stable, don't put it in the fridge). Add the heavy cream into the bowl 1/4 cup at a time, pouring slowly while using the hand mixer on low speed. Keep beating with the hand mixer on medium speed until you get soft peaks. You can keep it covered in the fridge for a couple of weeks (this is still dairy, so it will go bad at some point) or freeze it for 3 months. You can defrost and use the same way you do prepared cool whip. *Want to make your own corn syrup at home? I use a homemade thick simple syrup for this instead by mixing 8 tablespoons of sugar with 2 tablespoons of hot water. This makes a half a cup of homemade corn syrup. I have arthritis and can’t use a hand mix that long so I bought a KitchenAid stand mixer. Can I use that instead of the hand mixer? If so would I use the whisk beater and on what speed? I try to follow recipes exactly the first time I make a recipe, just in case! Thanks for your help. I’m really excited about having a healthier recipe for Cool Whip! Sometimes you can’t substitute Whip Cream in recipes and have to use it. You can definitely use a stand mixer with the whisk beater attachment. Unfortunately you really need the powdered milk for this recipe, sorry. So glad you’re enjoying the recipes, Barbara! More to come!! I was just wondering whats the science behind using powdered milk, instead of regular milk? Also, I wanted to know why kosher salt is preferred instead of regular salt? I’m a noob at homemade frostings so I’m just curious. I haven’t made the recipe but I will definitely try it. You want to use powdered milk because regular milk adds liquid and the recipe won’t come out correctly. I hope you find this easy to make and enjoy it! Glad you’re trying new recipes! I need 12 oz of cool whip for a recipe. Would this be enough? Can you tell me if you use full fat or low fat dried milk in this please? Hi, I would just like to ask if the temperatures you give us are in Fahrenheit or Celsius? 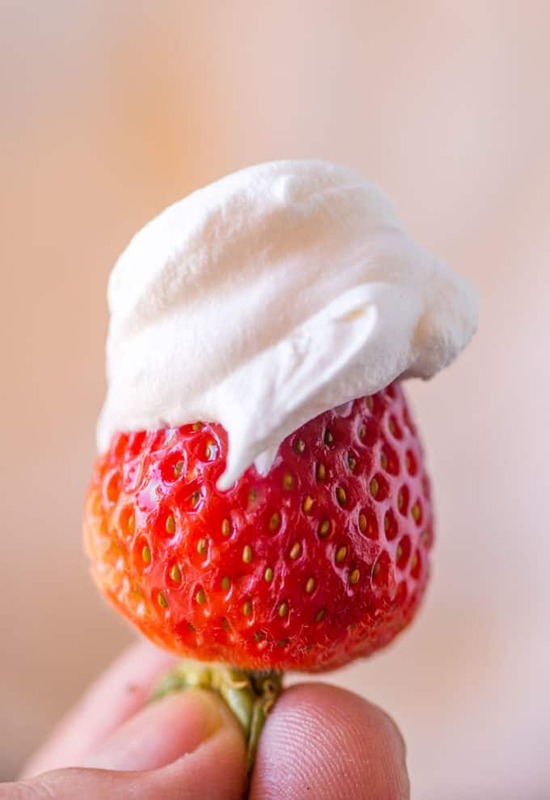 Whipped cream is easy…. 2 cups of heavy cream and add 2 tablespoon or so of sugar. Whip on the mixer setting and voila! Totally agree, but this isn’t a whipped cream recipe. This is specifically a Cool Whip copycat. 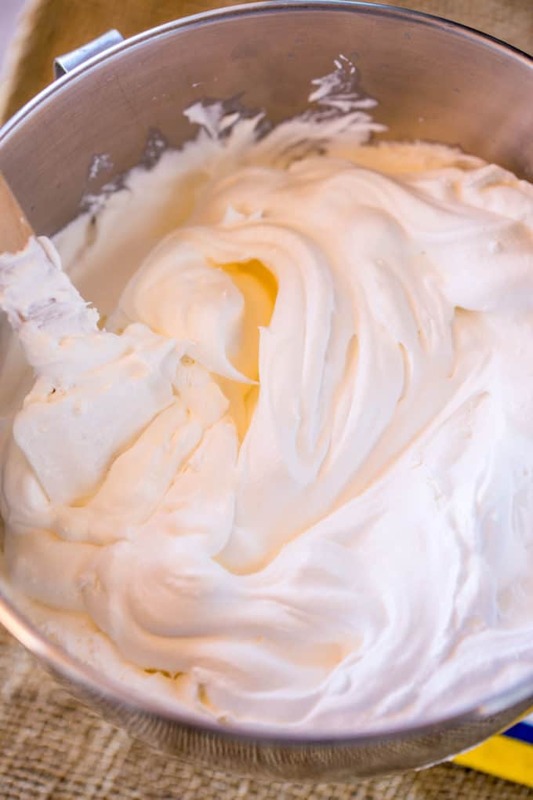 Cool whip has a much more stable consistency that is a whipped cream and marshmallow hybrid. I use this to be able to recreate dishes that require cool whip but to do it without using the pre-made product. This is literally such a genius idea to make your own Cool Whip!! After you try, I’d love to know what you think! It’ll definitely come in handy for the upcoming holidays. I have never thought to make cool whip at home! So cool! Trying it soon! Looks perfect! Will definitely have to try your recipe! Love homemade, and love that it’s also stable! Can’t wait to give this a try! 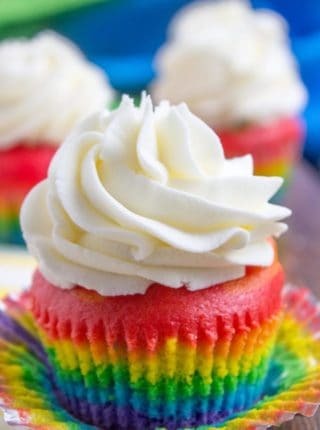 Awesome recipe to have on hand! So many don’t have Cool Whip available to them! I’d love to see a homemade version of Campbell’s Golden Mushroom condensed soup. 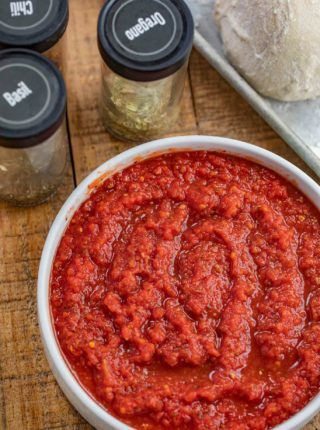 I used to use it in several crock pot recipes, but my husband is gluten free now and I’d like to be able to make it myself with gluten free flour. Thanks Jean! I added it to my list to try and decode. If I can replicate it I will absolutely post it. I have avoided buying cool whip for years because of all of the ingredients & partially hydrogenated fats. This is a great recipe. I like that it will store for a while as well. Great option for the corn syrup too. I can’t wait to try this recipe. I have been looking for a reason to buy a candy thermometer. Can the step with the metal bowl be done in a glass bowl instead? 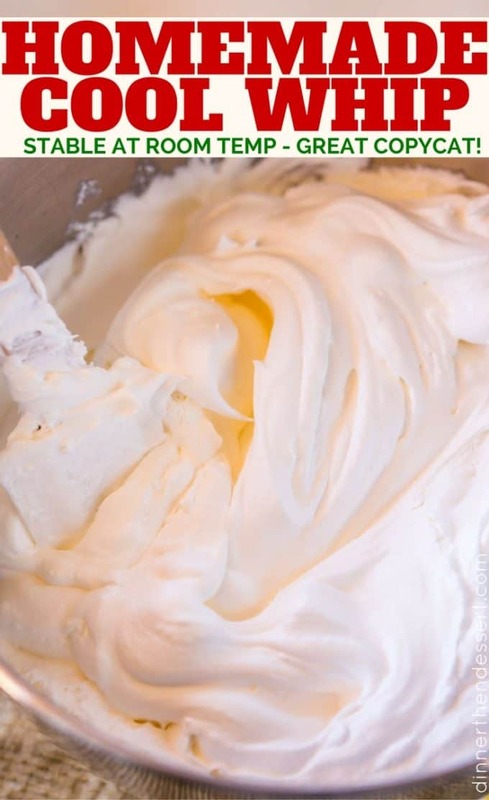 This recipe will serve you well, it has the same structure as cool whip and maintains the shape and consistency without the use of stabilizers that are unnatural. I chose metal because of the heat of the mixture, I worry someone may use it on a bowl that while being glass really isn’t meant to have boiling hot contents added. If you have glass you feel comfortable adding that hot mixture to ahead and do it, but remember it does risk cracking. Also the glass may hold the heat longer than the metal would and we’re beating the mixture to incorporate air and try and lose the heat. In the ingredients, you list 2 teaspoons of vanilla, but in the directions, it says to add the vanilla a tablespoon at a time. How much vanilla should be in this recipe? It means to add the “vanilla milk” in a couple tablespoons at a time. I added the word mixture to it to avoid confusion. Sorry for it being unclear.